Recently Apache Hama team released official 0.7.0 version. According to the release announcement, there were big improvements in Graph package. In this article, we provide an overview of the newly improved Graph package of Apache Hama, and the benchmark results that performed by cloud platform team at Samsung Electronics. Large scale datasets are being increasingly used in many fields. Graph algorithms are becoming important for analyzing big data. Data scientists are able to predict the behavior of the customer, the trends of the market, and make a decision by analyzing the graph structure and characteristics. Currently there are a variety of open source graph analytic frameworks, such as Google’s Pregel, Apache Giraph, GraphLab and GraphX. These frameworks are aimed at computations varying from classical graph traversal algorithms to graph statistics calculations such as triangle counting to complex machine learning algorithms. However these frameworks have been developed each offering a solution with different programming models and targeted at different users. In this article, we introduce the Apache Hama and its graph package. Apache Hama is a general-purpose Bulk Synchronous Parallel (BSP) computing engine on top of Hadoop. It provides a parallel processing framework for massive scientific and iterative algorithms. BSP is an easy and flexible programming model, as compared with traditional models of Message Passing, as shown in Figure 1. Figure 1. Bulk Synchronos Parallel (BSP) Model. Hama performs a series of supersteps based on BSP. 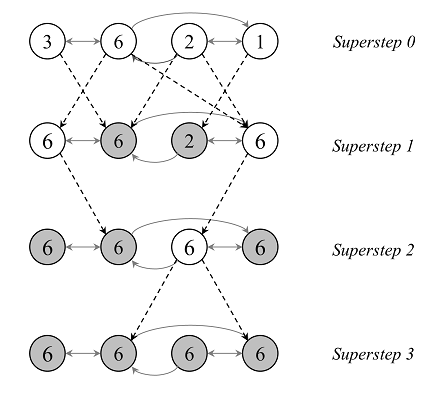 A superstep consist of three stages: local computation, message communication, and barrier synchronization. Hama is suitable for iterative computation since it is possible that input data which can be saved in memory is able to transfer between supersteps. However, MapReduce must scan input data in each iteration, and then output data must be saved in file system, such as HDFS. Hence, Hama can solve the problems which MapReduce cannot handle easily. 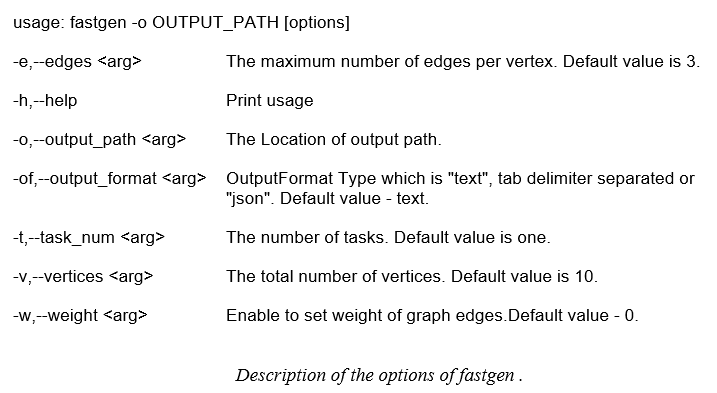 Apache Hama also supports a graph package which allows users to program applications for graph-parallel computations. The vertex-centric model is suggestive of MapReduce in that users focus on a local action, processing each item independently, and the system compose these actions to lift computation to a large graph dataset. It is easy to implement and prove to be useful for many graph algorithms. Figure 2. Finding the maximum value in a graph example. Dotted lines are messages. Grey vertices have voted to halt. Figure 2 illustrates the concept of graph processing in Hama using a simple example: given a connected graph where each vertex contains a value, it propagates the latest value to every vertex. Any vertex that has known a larger value from its messages sends it to all its neighbors in each superstep. When no more vertices change in a superstep, the algorithm terminates. If you want to know graph package in Hama, please refer to Apache Hama Programming. where r is the probability of the a random jump, E is the set of directed edge in the graph and PRt(j) denotes the page rank of the vertex at iteration t.
In this section, we describes our experimental setup with details about datasets and experimental platform. We conducted various experiments with PageRank algorithm on EMR cluster. We used graph datasets randomly generated using fastgen example in Hama. Also we run benchmarks on EMR cluster which consists of instance type of r3.xlarge. This instance type is memory-optimized instance type which has 30GB of RAM, and 4 vCPU. The cluster run on the hadoop 1.0.3(Amazon Machine Image version 2.4.11). That is because Giraph didn’t work well on hadoop 2. Hama provides pure BSP model via own cluster. Furthermore, it works on both Hadoop YARN and Apache Mesos. Although Giraph has same programming model like Hama, it works as a MapReduce job which means that it requires MapReduce framework. So Hama performed PageRank algorithm making its own cluster. On the other hands, Giraph perform MapReduce application on hadoop. For benchmarking of scalability, we increased the number of machines from 5 to 30 on a fixed dataset which has one billion edges (Figure 4). Both frameworks present significant scalability for same datasets. However, Hama has much lower execution time than Giraph for the same data set. Figure 3. The execution time on same data set, depending on the size of machines. From the computing performance’s point of view, Figure 4 shows execution time on same nodes, depending on the size of dataset. Hama also shows more powerful performance than Giraph for the same machines. The main reason that the result of benchmark shows different performance in spite of the same programming model is that we use the advanced PageRank algorithm which uses aggregators for detecting the convergence condition and the BSP framework’s efficient messaging system. Hama uses own outgoing/incoming message manager instead of Java's built-in queues. It stores messages in serialized form in a set of bundles (or a single bundle) to reduce the memory usage and RPC overhead. Also unsafe serialization is used to serialize Vertex and its message objects more quickly. Instead of sending each message individually, Hama packages the messages per vertex at once and sends a packaged message to their assigned destination nodes. 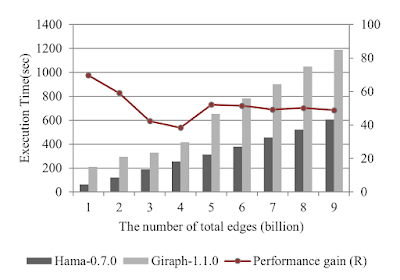 With this Hama v0.7 achieved significant improvement in the performance of graph applications. Figure 4. The execution time on same machine, depending on the size of dataset. 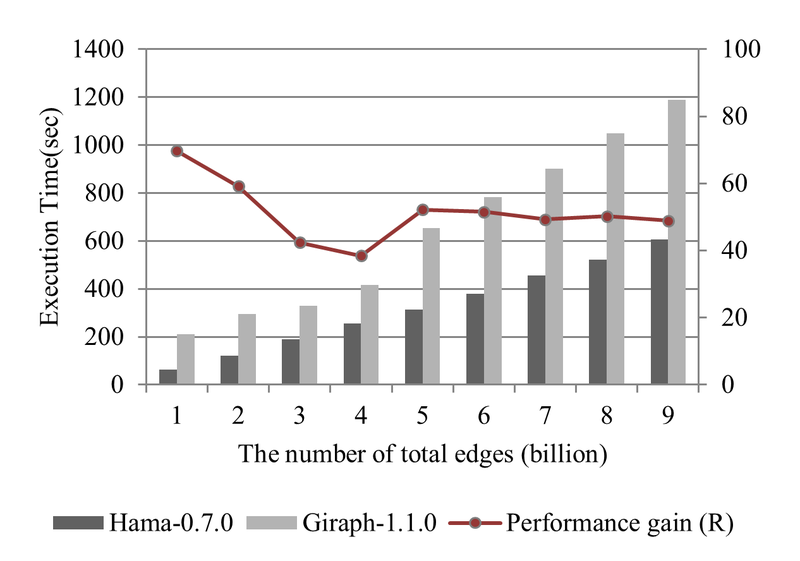 In this article, we presented a graph package of Hama. We also performed the performance of graph package, with Hama. 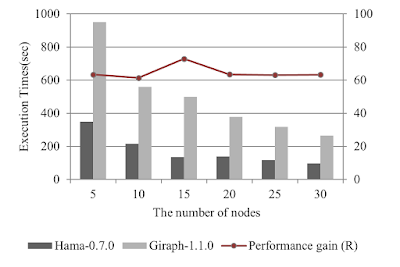 The performance compared with Giraph, in respect of computing and scalability. As a result, the performance and scalability are already satisfactory for graphs with billions of vertices. However, there are also a lot of improvement to be done based on the current version. Efficient load balancing, spillable vertices storage and message serialization are challenging issues. We look forward to add these features and see our community growth. G. Malewicz, M. Austern, A. Bik, J. Dehnert, I. Horn, N. Leiser, and G. Czajkowski. Pregel: a system for large-scale graph processing. Principles Of Distributed Computing (PODC), 2009. Dean, Jeffrey, and Sanjay Ghemawat. "MapReduce: simplified data processing on large clusters." Communications of the ACM 51.1 (2008): 107-113. Page, Larry, et al. PageRank: Bringing order to the web. Vol. 72. Stanford Digital Libraries Working Paper, 1997. Satish, Nadathur, et al. "Navigating the maze of graph analytics frameworks using massive graph datasets." Proceedings of the 2014 ACM SIGMOD international conference on Management of data. ACM, 2014. Minho Kim is a software engineer at Samsung Electronics in the Cloud Technology Lab. Minho is a committer of Apache Hama project, which is a general BSP computing engine. He has been developing and contributing to Apache Hama. 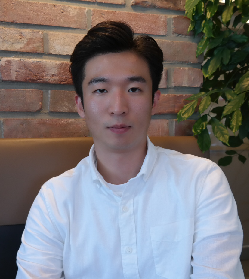 Minho’s research interests include deep learning such as DNN, and CNN. This sounds excellent and worth an evaluation .... I had been struggling with other graph db/frameworks. Minho, did you benchmark Giraph with fault tolerance enabled? Because the execution overhead in time you see comes from spilling stuff to disk. Otherwise this is a bit like apples vs. oranges. I agree with you that Giraph with fault tolerance affects results of benchmark, if it enabled. 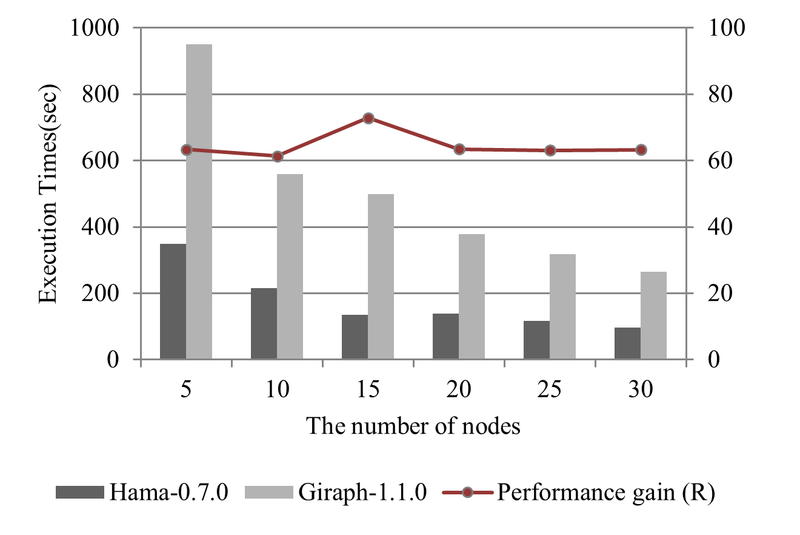 But I compared performance between Hama and Giraph without fault tolerance enabled.